(b) technical standards and methods to be used for the filling in of the uniform visa. 2. The colours of the visa sticker may be changed in accordance with the procedure referred to in Article 6(2). 3. In accordance with the procedure referred to in Article 6(2), it may be decided that the specifications referred to in Article 2 shall be secret and not be published. In that case they shall be made available only to the bodies designated by the Member States as responsible for the printing and to persons duly authorised by a Member State or the Commission. 2. Each Member State shall designate one body having responsibility for printing visas. It shall communicate the name of that body to the Commission and the other Member States. The same body may be designated by two or more Member States for this purpose. Each Member State shall be entitled to change its designated body. It shall inform the Commission and the other Member States accordingly. For the purposes of this Regulation, ‘visa’ means a visa as defined in Article 2(2)(a) of Regulation (EC) No 810/2009 of the European Parliament and of the Council of 13 July 2009 establishing a Community Code on Visas (Visa Code) ( 1 ). 2. Where reference is made to this paragraph, Articles 5 and 7 of Decision 1999/468/EC ( 2 ) shall apply. The integration of the photograph provided for in point 2a of the Annex shall be implemented at the latest five years after the adoption of the technical measures provided for the adoption of this measure in Article 2. 1. An integrated photograph produced to high security standards. 2. An optically variable mark (‘kinegram’ or equivalent) shall appear in this space. Depending on the angle of view, 12 stars, the letter ‘E’ and a globe become visible in various sizes and colors. 3. The logo consisting of a letter or letters indicating the issuing Member State (or ‘BNL’ in the case of the Benelux countries, namely Belgium, Luxembourg and the Netherlands) with a latent image effect shall appear in this space. This logo shall appear light when held flat and dark when turned by 90°. The following logos shall be used: A for Austria, BG for Bulgaria, BNL for Benelux, CY for Cyprus, CZE for the Czech Republic, D for Germany, DK for Denmark, E for Spain, EST for Estonia, F for France, FIN for Finland, GR for Greece, H for Hungary, HR for Croatia, I for Italy, IRL for Ireland, LT for Lithuania, LVA for Latvia, M for Malta, P for Portugal, PL for Poland, ROU for Romania, S for Sweden, SK for Slovakia, SVN for Slovenia, UK for the United Kingdom. 4. The word ‘visa’ in capital letters shall appear in the middle of this space in optically variable coloring. Depending on the angle of view, it shall appear green or red. 5. This box shall contain the 9-digit national number of the visa sticker, which shall be pre-printed. A special type shall be used. 5a. This box shall contain the three-letter country code as set out in ICAO Document 9303 on machine-readable travel documents ( 3 ), indicating the issuing Member State. The ‘number of the visa sticker’ is the three-letter country code as set out in box 5a and the national number as referred to in box 5. 6. This box shall begin with the words ‘valid for’. The issuing authority shall indicate the territory or territories for which the visa is valid. 7. This box shall begin with the word ‘from’ and the word ‘until’ shall appear further along the line. The issuing authority shall indicate here the period of validity of the visa. 8. This box shall begin with the words ‘type of visa’. The issuing authority shall indicate the category of visa in conformity with Articles 5 and 7 of this Regulation. Further along the line the words ‘number of entries’, ‘duration of stay’ (i.e. duration of applicant’s intended stay) and again ‘days’ shall appear. 9. This box shall begin with the words ‘issued in’ and shall be used to indicate the place of issue. 10. This box shall begin with the word ‘on’ (after which the date of issue shall be filled in by the issuing authority) and further along the line the words ‘number of passport’ shall appear (after which the holder’s passport number shall appear). 11. This box shall begin with the words ‘Surname, Name’. 12. This box shall begin with the word ‘remarks’. It shall be used by the issuing authority to indicate any further information which is considered necessary, provided that it complies with Article 4 of this Regulation. The following two and a half lines shall be left empty for such remarks. 13. This box shall contain the relevant machine-readable information to facilitate external border controls. 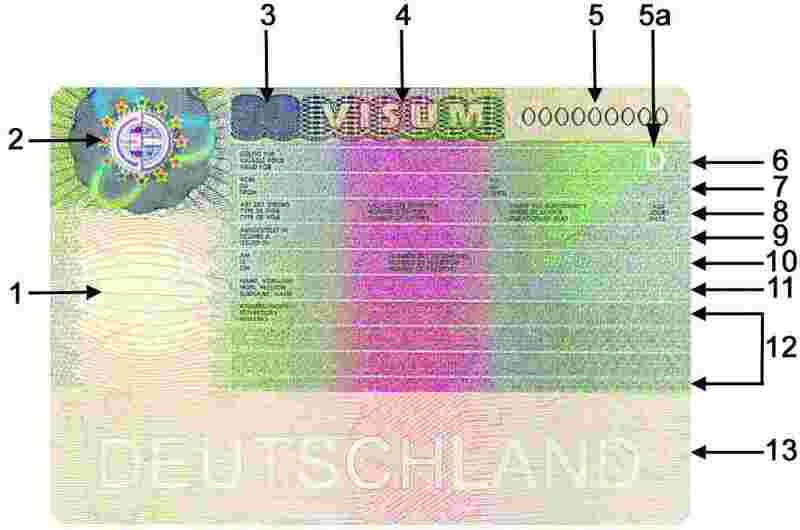 The machine-readable area shall contain a printed text in the background printing, indicating the Member State issuing the document. This text shall not affect the technical features of the machine-readable area or its ability to be read. The paper shall have a natural colouring with red and blue markings. The words designating the boxes shall appear in English and French. The issuing State may add a third official Community language. However, the word ‘visa’ in the top line may appear in any one official language of the Community. ( 1 ) OJ L 243, 15.9.2009, p. 1. ( 2 ) OJ L 184, 17.7.1999, p. 23. ( 3 ) Exception for Germany: ICAO document 9303 on machine-readable travel documents provides for Germany the country code ‘D’.